I am sad to say that this will be my last post for a while. I am experiencing physical problems, that have limited my baking and cooking abilities, so I can't enter as many posts as I would like. Until I find out what the exact problems are, I am unable to focus on my blog. Plus, I have several Dr. appointments and tests ahead of me. I have met many wonderful friends in my short period of blogging. Before I started blogging, I had no idea there was a whole new world on the the other side of my screen. The Foodbuzz community is wonderful. Don't be surprised if I pop in and visit one of your blogs occasionally. If any of you out there are experiencing health issues and blog occasionally, I'd love to hear from you. Leave me a comment, and I will get in touch with you. Mix the oatmeal and milk together in a large bowl. Add the raisin, grated apple, beaten egg and vegetable oil. Stir.In another smaller bowl, mix the flour, sugar, baking powder, salt, nutmeg, and cinnamon. Stir the combined dry ingredients into the oatmeal mixture only until moistened. Line 12 muffin cups with liners and fill 3/4 full. Bake at 400 degrees for 15-20 minutes. Cool 5 minutes, remove from pan. Serve warm or cooled. When cool mix glaze ingredients in small bowl until a thin consistency to pour from a spoon. 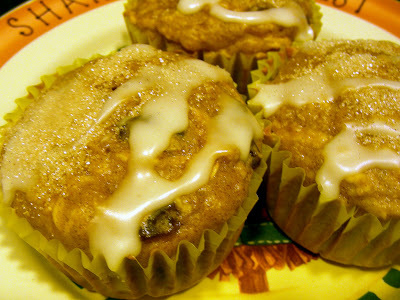 Drizzle glaze over cooled muffins, and sprinkle with a small amount of mixed cinnamon and sugar. These look great, i am going to try them! Feel better and come back soon! You'd better keep in touch! I've enjoyed our friendship via the Internet and will keep you in my thoughts and prayers as you work through these health and pain issues. Hugs. I'm sorry your not feeling well Becky! Sending my prayers and a big hug! Please don't be a stranger, I'll miss reading your posts, but I don't want you to be in pain. Keep us posted on how you are doing and don't be shy about sending me an email if you need something! I am so sorry that you are having health problems :( Please take care of yourself! egbkid- These muffins are great! Thank you for the get well issues. Gina- Your kind words and prayers are greatly appreciated. I Have enjoyed your friendship as well. I will keep you posted. Natasha-Thank you for well wishes. Good Luck in PFB #3. Your dinner party was amazing! Sorry to hear this Becky. I know how you feel. I've had to scale back my cooking this past year as I get physically tired standing for too long at the kitchen bench. I hope you feel better soon and comeback to blogging. Barbara- Thank you for the kind words. I hope that I'll be able to come back soon. I'll keep you posted. Your muffins look great, and the glaze is wonderful!